Happy Bloggers Challenge Friday! Thanks to those who played along with the Stencil Challenge, I always love to see what other people are creating with stencils, the challenge this week is Fall Leaves. Autumn is one of my favorite seasons, as I love to watch the colors change on the trees! For the challenge this week, I used real leaves on my Gelli Arts Plate along with DecoArt Paints and stamps/dies from Our Daily Bread Designs to add leaves to a home decor piece. Here is what my Gelli Print panel looked like after stamping the leaves from the Autumn Blessings stamp set. The leaves were die cut using the Fall Leaves and Acorn Die, scrunched a bit, then added to the jar using Pop Up Glue Dots. The verse is from God's Timing stamp set, stamped in Black Archival Ink on Vanilla card stock then die cut with the Vintage Labels Die. 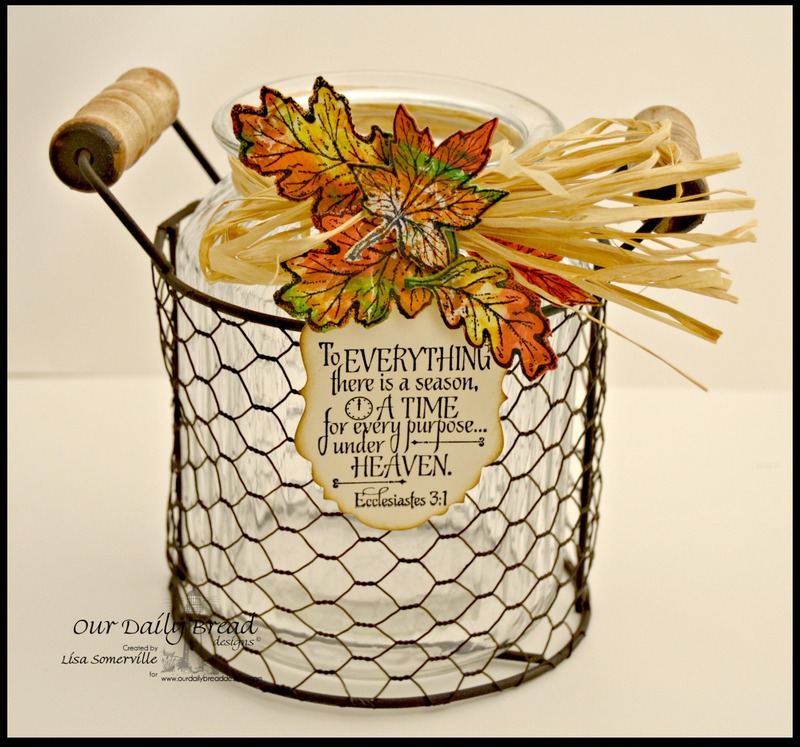 All Autumn and Thanksgiving stamp and Custom Dies are on sale at ODBD through Saturday, October 26th, 2014, click here for more details. If you'd like to play along with this weeks Bloggers Challenge, please link back to this post on your blog and mention you created your card for the Bloggers Challenge Fall Leaves Challenge. Please add your link using the Link Tool below, your link should be a direct link to your Bloggers Challenge Post, use your name as the Title. Please do not link to cards that were created prior to the challenge date. Entries not linking properly, or backlinked will be removed. If you have the captcha enabled on your blog, please consider turning it off, as it makes it so much easier to leave comments.